This scene in the headwaters of the West Fork of the Hood River was captured a few weeks ago, as early autumn colors began to sweep through the forest. This particular stream is McGee Creek, one of the larger tributaries that feeds the West Fork. Most hikers know McGee Creek from its alpine origins, where it tumbles from the wildflower meadows that sprawl below popular McNeil Point. 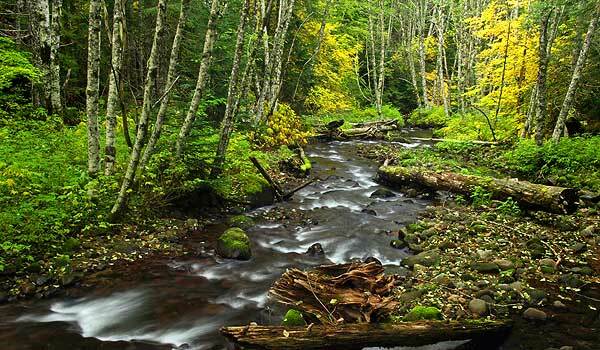 But the creek soon enters lush forest on its way to joining the West Fork. The steam engine in this old photo is at roughly the same spot as the autumn scene in the upper photo, illustrating the remarkable resilience of our forests. In about the span of an average lifetime — just 75 years — the forest along this stretch of McGee Creek has recovered from complete destruction, largely on its own. This is good news for other areas of Mount Hood and the Gorge that still show the scars of logging and road building. Given time and some modest restoration efforts, even the most damaged ecosystems will recover. The autumn scene on McGee Creek also holds some lessons for restoration that may not be immediately obvious. The large log lying along the right side of the creek, for example, was carefully placed there by biologists, just a few years ago. This was in recognition that a century of logging has deprived our streams of large woody debris that turns out to be an essential ingredient for healthy fisheries. Perhaps most importantly, the white-trunked alders that line McGee Creek show that the forest here is recovering through natural succession. These pioneering trees provide quick cover and their dense root systems help prevent soil erosion. 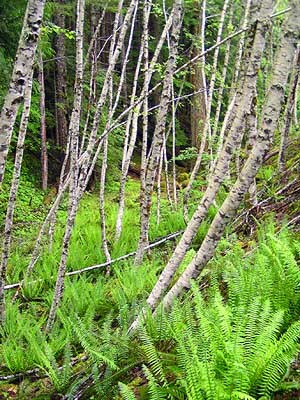 Red alders are short-lived, adding their fallen debris to the rich duff layer they help build in recovering areas. Amazingly, they actually fix nitrogen in the soil through their roots, enriching it for the big conifers that will follow. Finally, the light canopy they provide allows for a complex understory of plants to develop in tandem with the alder groves, ensuring that forest diversity is re-established during the recovery cycle. 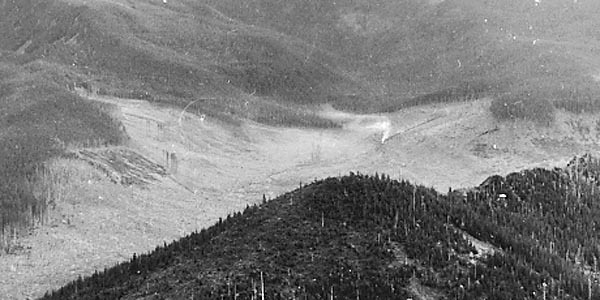 When McGee Creek was logged, the natural recovery that followed was mostly accidental — early timber operations viewed the forests as limitless, and logged areas were mostly ignored once the trees had been cut. The shift to cultivated tree farms didn’t begin until the late 1940s and the era of road-based logging. In these more recently logged areas, the pioneer, non-commercial hardwoods like red alder were usually killed with herbicides in order to promote the quick growth of commercial timber species, especially Douglas fir. This practice has led to the thickets of crowded fir trees that we see today. These unnatural stands are vulnerable to disease and fire, and have almost no understory to provide for bio-diversity and wildlife habitat. Sadly, it will take decades to thin these misguided plantations and decommission the failing logging roads that threaten streams and slopes. But though the task of forest recovery and restoration is a tall one, the good news is that the lessons of natural succession from places like McGee Creek have worked their way into forest management. Our scientists are now learning to work with nature, not control it — by letting the red alders grow. As we continue to turn the page on past practices and begin a new era of restoration for the forests of Mount Hood, we can take some degree of consolation in knowing that a complete recovery is well within our reach. By watching and learning from the forest ecosystem, we now realize that the natural processes that have renewed our forests for millennia must be allowed to follow their ancient course, once again.